Vortex Optics, out of Middleton, Wisconsin seems to be taking the field by storm. Competing and taking market share from companies like Luepold, Nightforce, Sightron and others who’ve been around much much longer! I have a new Thompson Center Dimension in .308 Winchester on the way, so I was looking for a scope in the 6-24 range, and the First Focal Plane (FFP) functionality of the Vortex PST was very attractive. To explain, First Focal Plane means that the reticle size adjusts with the zoom level. So the reticle at 6 power will be smaller than the reticle at 24 power and vice versa. 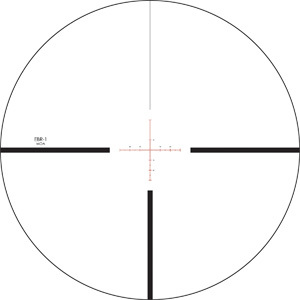 I ended up going with the EBR-1 (MOA) reticle, as my brain just cannot seem to comprehend MRAD 🙁 Regardless of which reticle you go with, the Vortex PST reticle is illuminated, with 10 different brightness levels. Once my new rifle shows up, I’ll get the scope mounted and add some photos.